What´s this? Chaos Ogres? In BloodBowl? Never heard of them. Yeah it´s not an official team per se, but bear with me. There is one available in the Chaos Pact team right and it´s not as if Chaos Ogres are totally unheard of in the Warhammer Universe, in the Old World that is. What´s transpiring in the bubbly realms that is called AoS I don´t know. So it´s an Ogre team, dedicated to the Chaos God Slaanesh. Ostland is the most ogrepopulated province in the Empire so that is where they recide. Ferlangen is a small town in the Ostland province of the Empire. It´s mostly known as a trading town and has an abundance of antique shops, but also the famous Brewery of Sam Bugman. Perfect place for a Slaaneshi Ogre Team right? Here is a background thing I did for the Team Cup here in Stockholm 9-10 of April. Turned out alright I think. In the team cup I´ll be joining forces with Pidpad, kaju and jox and the idea behind the cup is to focus on the performance of the team as a whole rather than the individual coaches. They did one last year, but I wasn´t able to participate then. I think it will be great fun. The Ogres are based on 40K Nobz and Badruks Flash gitz. The second one from the right is greatly inspired by the old Hackflem Skuttlespike, I call him Gobblewhip Ripfiend. He will probably be a warpstone troll later on, when this team transforms into an Underworld one. Well, that is the current plan at least. Here are the markers, new addition is the whfb chaos familiar second from left. Left to right, apo, cheerleader and coach. The apo is a secret admirer well known in society. But Slaanesh has followers everywhere. The miniature is found from Casting Room miniatures (an offspring from wargames foundry) and they are called Plague doctors. The snake on the base are from the whfb lizard swarm. 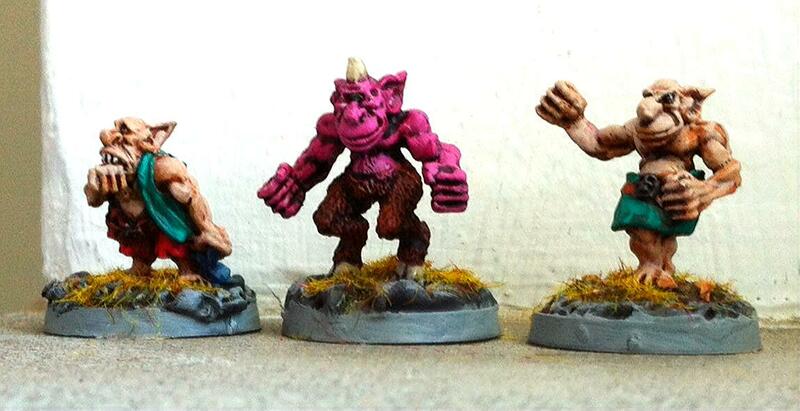 The cheerleader, forming the firm Järvens Espingar is an not-Bob-ogre made by Hungry Troll. The coach have I witten about earlier here. Slaanesh devotees, since the crab is sacred. Hail to the Serpent! These chaps will ultimately be the backbone in my future Underworld team for BloodBowl, but first another assignment awaits. Since number six is sacred by Slaaneshi cultists, these first six chaps form one of the covens for this Bloodbowl team in particular, counting as snotlings statwise. 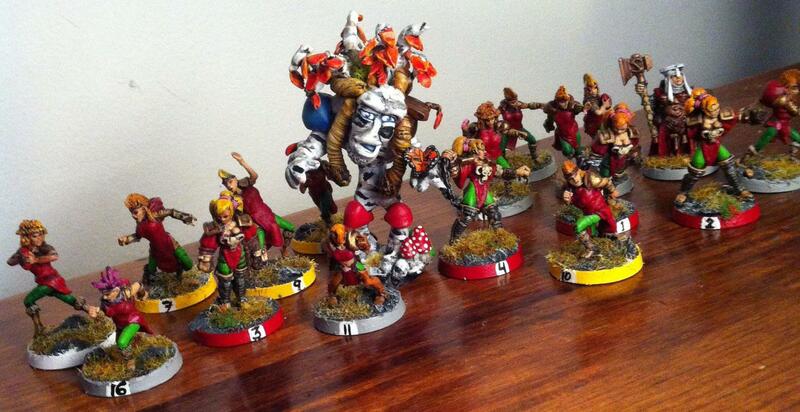 The seventh goblin is the waterboy/bloodweiser babe of the team. 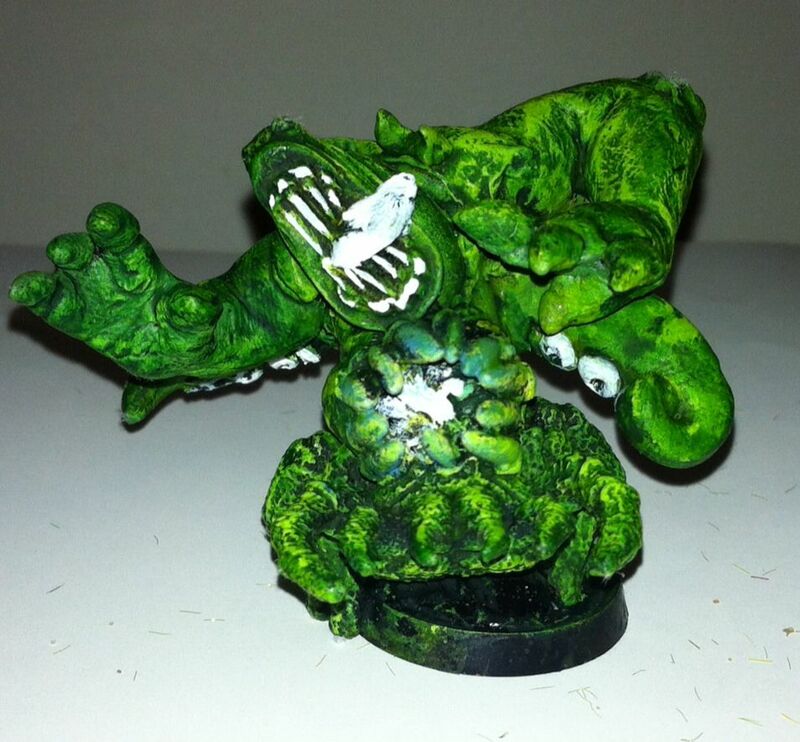 It´s an offspring from Wargames Foundry, they are sculpted by John Pickford. These two are markers for turn and re-roll and possible if there are any touchdowns for the team. 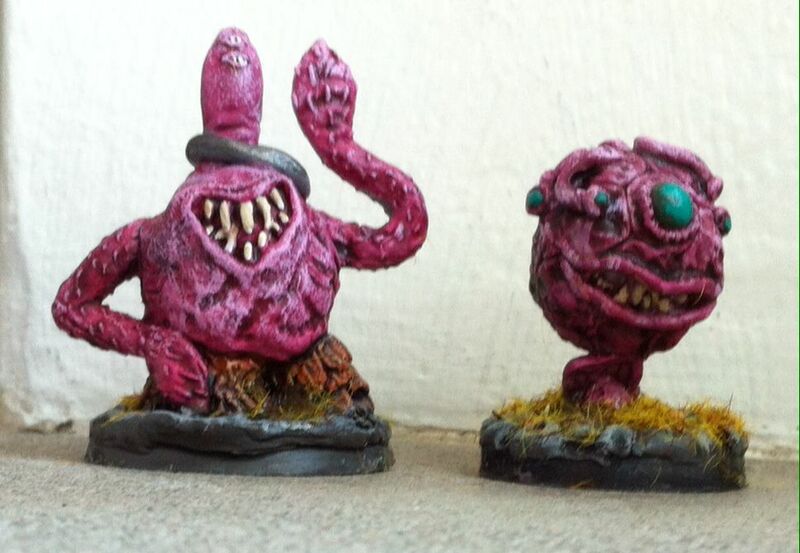 The models are Grenadier from their AD&D range “2012 Dwellers below“, a Beholder and an Otyugh. 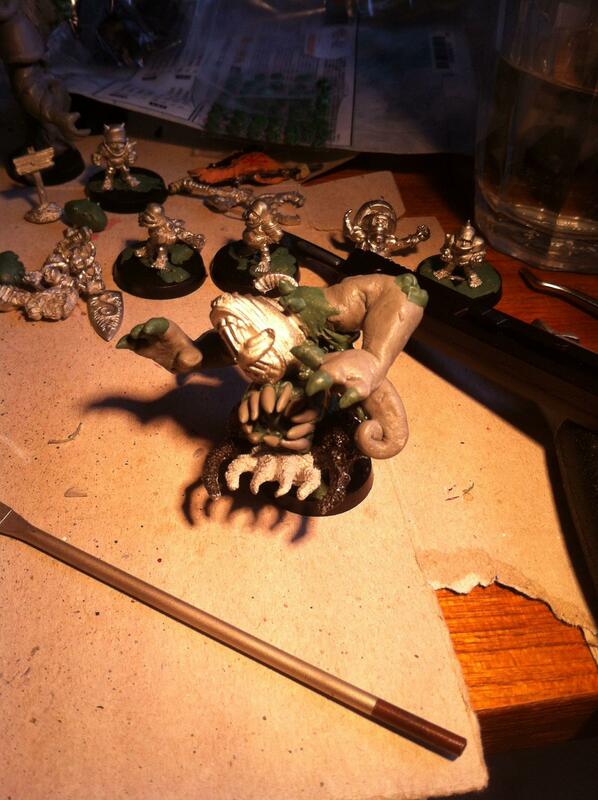 The Otyugh is being somewhat restrained by an orcling from Wargames Foundry (a Kevin Adams sculpt). Otyugh and the Beholder is about as old as me, casted in the early eighties. 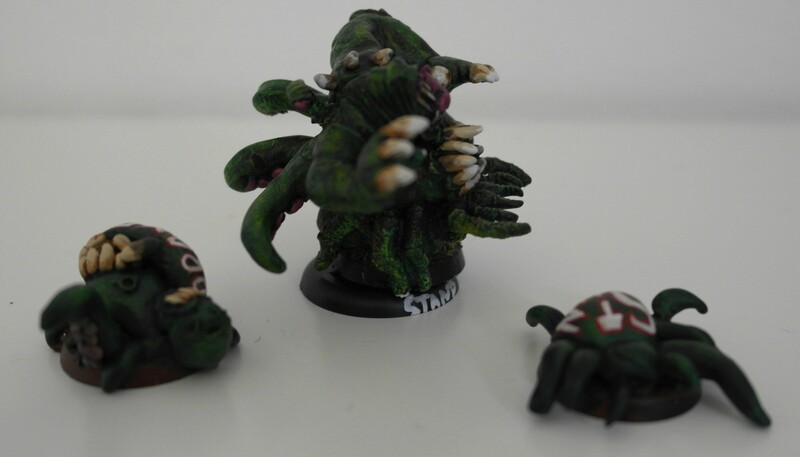 Author suncarPosted on 21 March, 2016 21 March, 2016 Categories Bloodbowl, paintingTags 28mm, AD&D, Bloodbowl, casting room, Jaded Serpents, John Pickford, Kevin Adams, miniatures, painting, wargames foundryLeave a comment on Chaos Goblins! 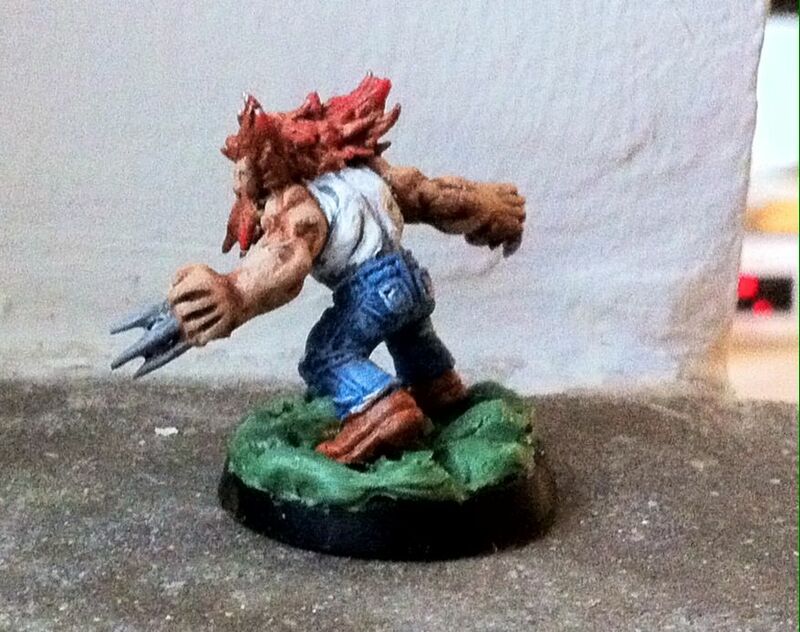 Painted miniature number 14 this year is this guy, I´m calling him Järven. It´s Swedish for the animal that shares the name with a known superhero. The model is made by Rykar Jové from Spain, check out his ebay account (z.ryk) for more amazing stuff. 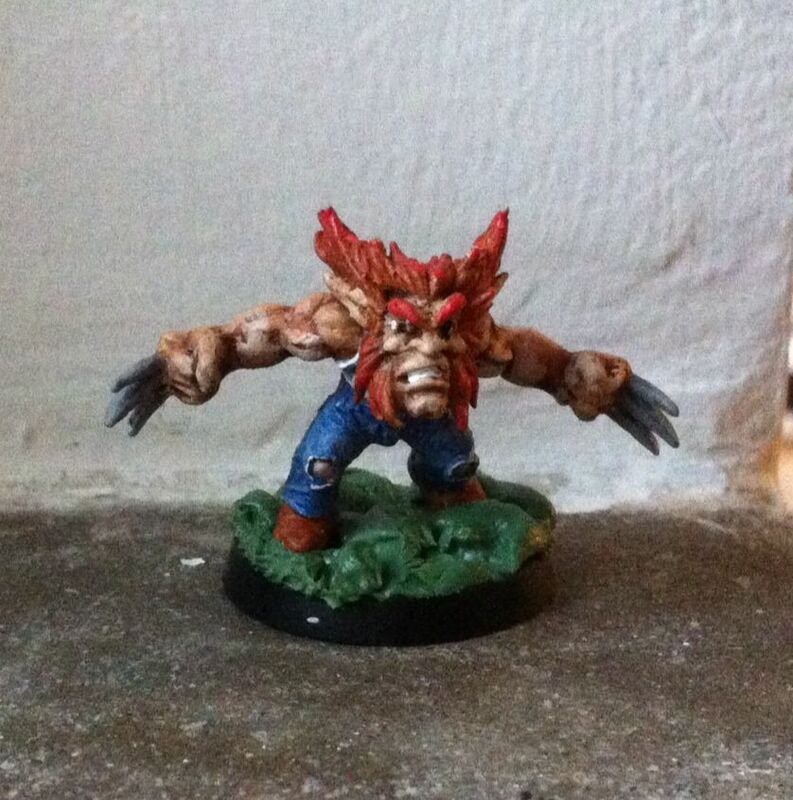 He´s been doing Asterix, Obelix and Dogmatix/Idefix minis recently, a fact that made me buy my first minis for this year. The goal is still to shrink the unpainted leadpile, but that does not mean that one has to miss out on golden opportunities when they present themselves. Oh well. He´ll be a blitzer in the Underworld team but first he´ll be the coach of another team, originating from the imperial province of Ostland. I´ll be more detailed on the background in a further post. The name of the team however is Ferlangen Jaded Serpents and their devoted firm goes by the name Järvens Espingar (that´s Swedish for Wolverine´s Baby Serpents). 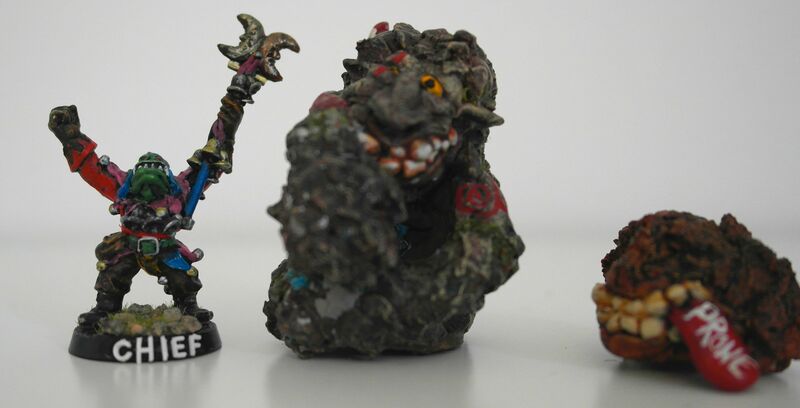 Hopefully I´ll get a chance to do their cheeleader as well, that mini is also quite badass. The numbers in the painting line keeps adding up but it´s perfectly fine, since they are all splendid miniatures. The team name is a reference to a cult of worshippers in the mythos of Svenska Kulter by Anders Fager. Team logo is used by permission from him, if you want merchandise with it, please visit this place. 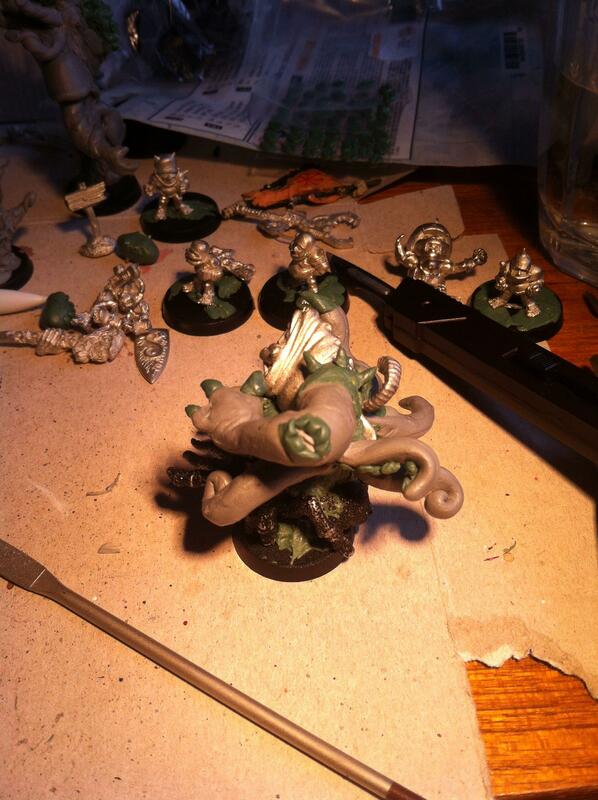 First out are the Nurgle warriors, I´ve used whfb Blightkings for that. Only conversion is removing of weapons. Here is the Beast of Nurgle, with a prone and stunned marker. 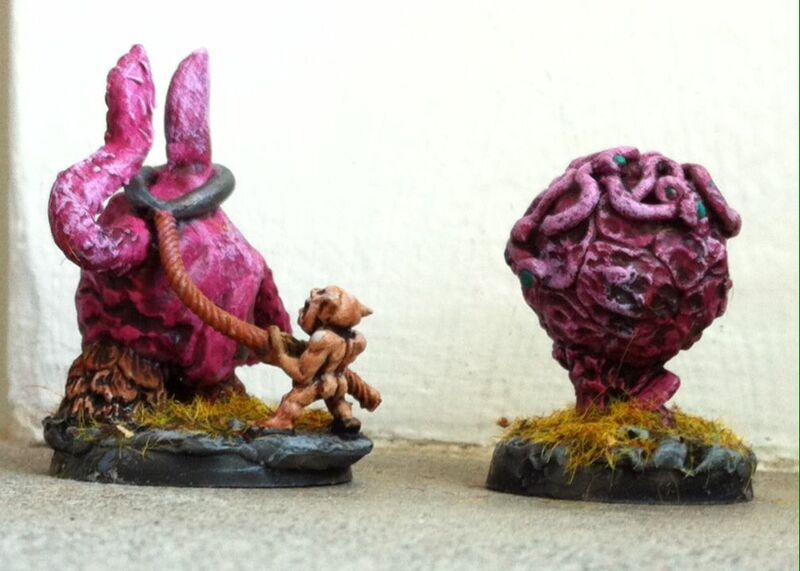 The conversion is made out of a squig placed on a spider. I quite like him, check out WIP pics below. 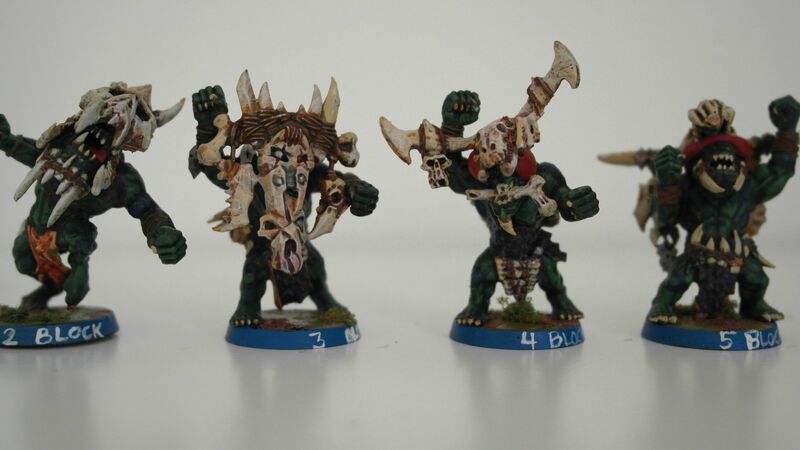 Here are the pestigors, the two on the left are basically whfb pestigors with some addition of pink horror arms and headswapping (a banner skull and a gorkamorka cybork head). The ones on the right are savage orcs with head swaps. And here are the rotters, represented by opponents that all have been blessed by the rot. From left: Dwarf from Battle of Skull Pass starter set, Gorkamorka Yoof with added tounge, WHFB Gnoblar, Orc crewman from Orc Chukka / Bolt thrower, Scotling from Impact miniatures and a whfb Orc Boy. First team I finished after getting back to the table top pitch in 2013 after almost a 15 year hiatus. This team was taken to Stockbowl Cup IV, a Stockholm based tournament. Great fun, did OK; three wins, one draw and two losses. Not enough guard and no strip ball at all, but using chainsaw was awesome. Thrower and Black Orcs: WHFB Grimgor Ironhide, Ogre, 40K Warboss and mostly two GorkaMorka Nobz. 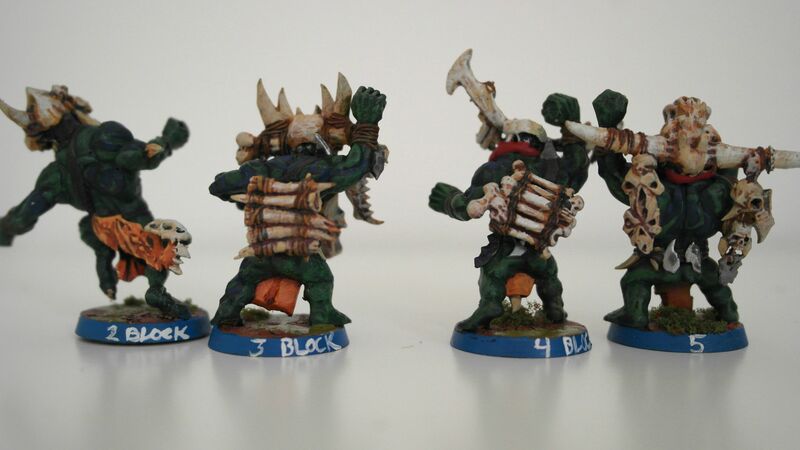 Lineorcs: WHFB Big´Uns, Savage orc big boss and a Black orc blocker miniature. 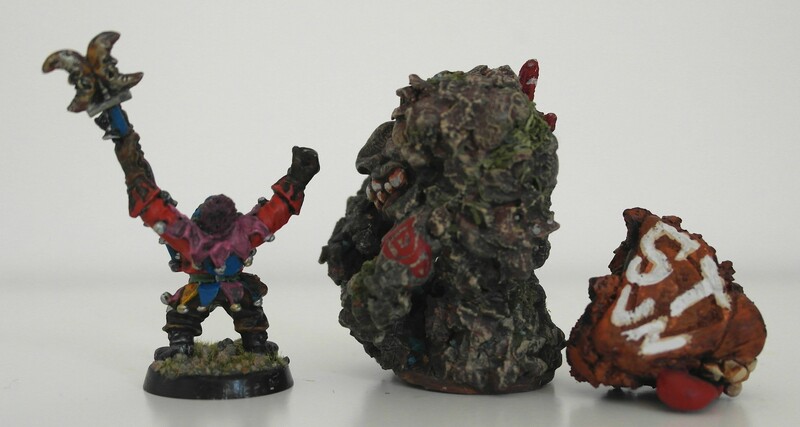 Varag ghoulchewer, Ugroth Nolgrot and the apothecary. 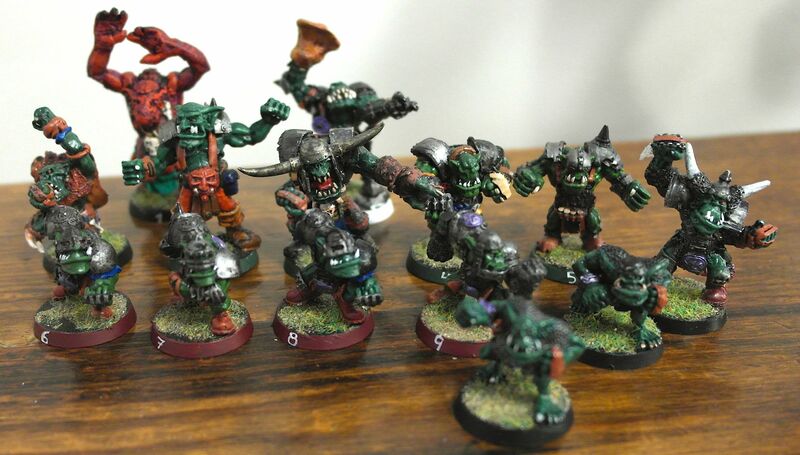 The models are the “Animosity orcs” from GW and a 4o Gretchin. The chainsaw is from GI Joe and the tank from an old “Skorcha warbuggy“. 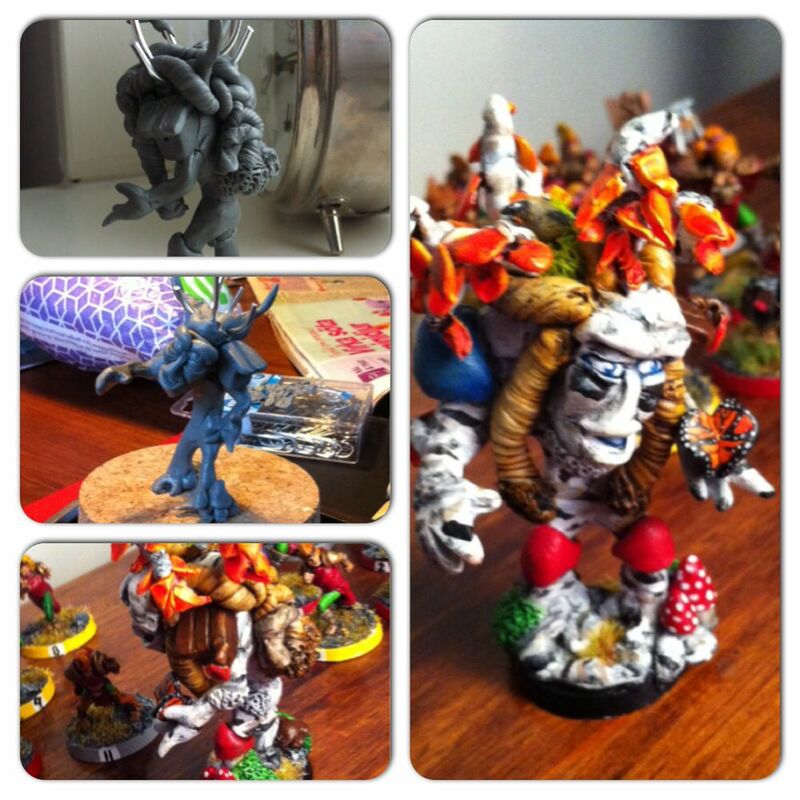 The troll is from the whfb starter box Battle from skull pass, but modified a bit. I´ve been inspired by the mythos of entwives for quite a while, how would they look? There are clues here and there in Tolkiens stories, Treebeard describes their hair as the hue of ripe corn. They are supposedly Guardians of agricutural plants. In my mind this entwife took shape, in form of a birchtree. 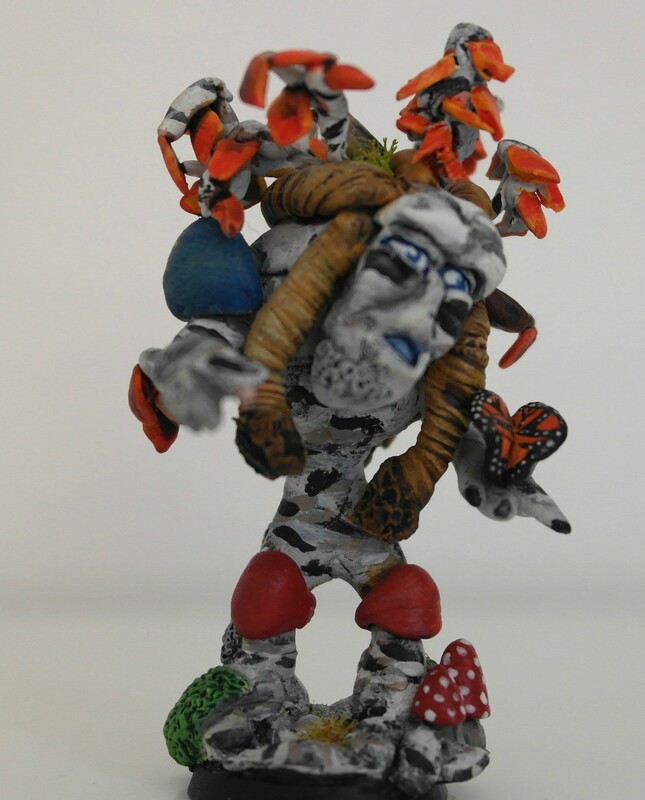 When I did a druid type of BloodBowl team that could work as Amazons, Wood Elves or Humans then the need for a proper Treewoman resurfaced. Since creation, Autumn Birchtree has participated in one tournamnet together with a halfling team (standing in for Deeprot Strongbranch that is). Sadly, no play for the Druids yet. But they´ll get there, it was great fun to develop Birchtree. The hair is supposed to resemble wheat, and the leaves are a sign of autumn. Btw I love the new GW glazes. Majority of figures are Neomics Punkzons but there also some Necromunda Eschers, Mordheim Sister of Sigmar and Warzone Imperial Mourning Wolves (From the Mutant Chronicles Universe). Weapon have been snipped and they´ve all received cloaks to be more uniform and druidlike in appearance. Haven´t gotten around to do a proper background story yet but I´d say it will probably be about income generation in order to save a certain forest or something like that. 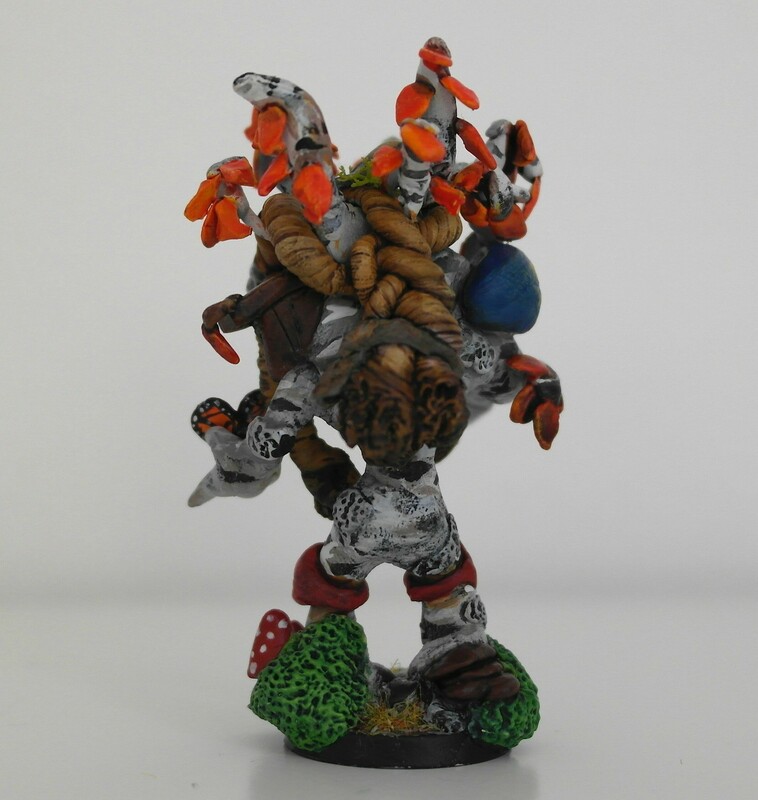 From the Marshes of Madness in the middle of Badlands territory stems the team of Bubba´s Brawlerz. How the team was founded is still shrouded in darkness but what is known is that Chief Bubba himself likes to surround himself with loads of braggadocious black orc blockers and brawling blitzers rather than bickering lesser greenskins such as gobbos. As soon as a player is accepted to the team a new name is given to the newcomer. Bubba says that it is to create a more uniform team identity but it might as well be that he´s just lazy. Ive played a season so far with them, they are doing quite well. Watch their progress on the pitch here. Here are Chief Bubba and the troll Klonk together with the prone/stun marker. 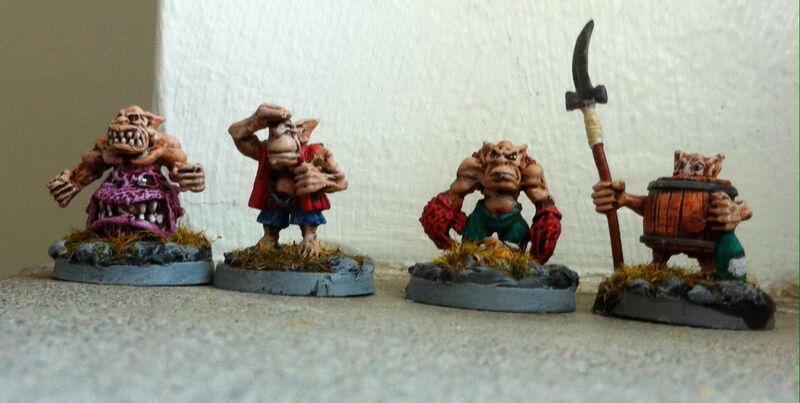 Gobbo, throwers and line orc. Base for the team is WHFB save orc regiment box, with added minis for throwers (orc shamans) and chief (40K ork warphead). 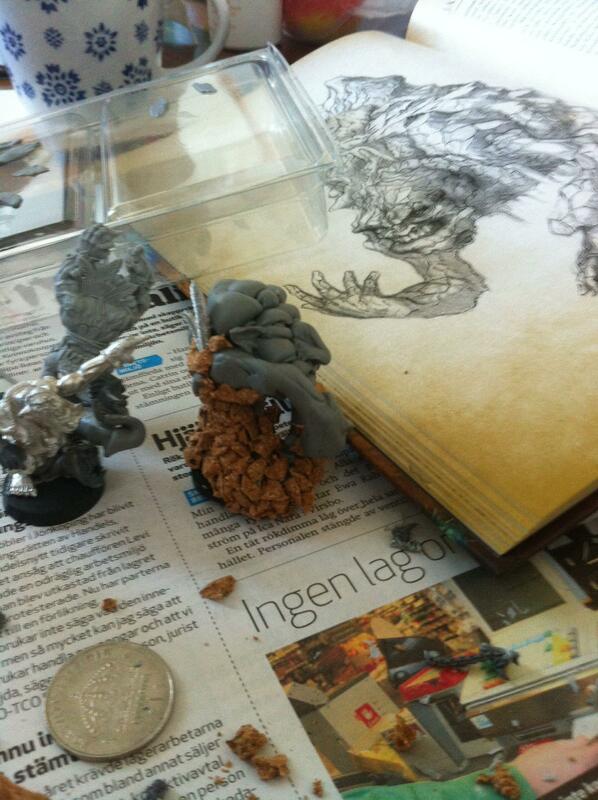 The troll is made from scratch, by grey stuff and cork, see progress pic below. thesuncarvault Create a free website or blog at WordPress.com. 40k Inquisition, miniature painting and conversion.